Keith Stern is challenging incumbent Gov. Phil Scott in the Republican primary. Stern says Scott has been a "huge disappointment." So, Stern is challenging the governor and seeking to sway voters on the right who feel let down by Gov. Scott. A week before the primary, Stern was making the rounds at the Addison County Fair and Field Days, stopping by every table inside the fair’s main exhibit hall to introduce himself. He went up to a woman who was offering free estimates for shower installations. He handed her a pamphlet that read ‘smaller government, bigger economy’ and he laid out his plans. “We’re going to cut taxes, we’re going to make the state overall more affordable, we’re going to have money to take care of the roads,” he said. “That would be wonderful,” said the woman. Stern said goodbye and headed over to the next table to talk to more potential voters. 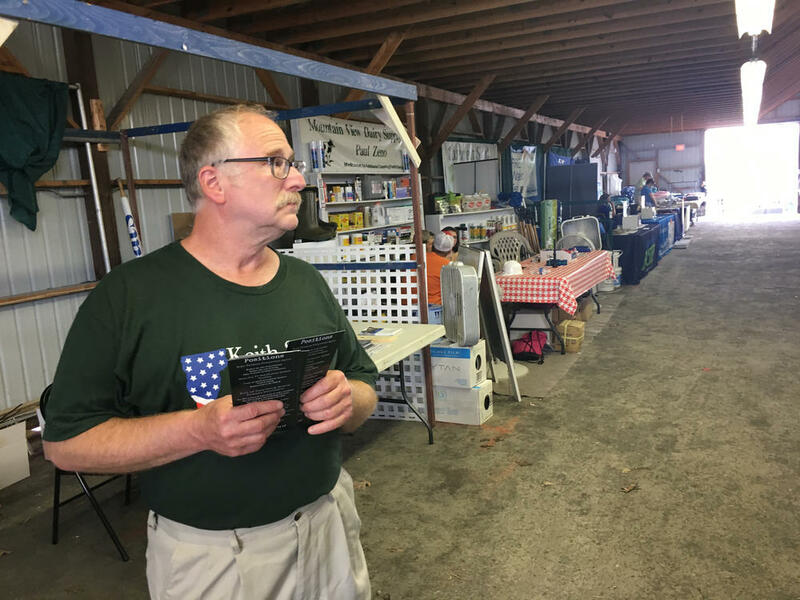 Keith Stern walks around the Addison County Fair And Field Days, handing out campaign flyers. Besides being on a local zoning board, Stern has never held elected office, though he has run statewide campaigns before. He's run for U.S. Senate once and the House of Representatives twice. This time he's running for governor because he says the state needs to be saved. Stern is a life-long Vermonter. He and his wife run a produce store in White River Junction. Stern announced he would challenge Gov. Scott last July and run as a Democrat. Stern said he thought his goal of making Vermont more affordable would align with the Democrats. But he says he feels Democrats don't want to shrink the size of government so he moved right, to the Republican ballot, to challenge an incumbent governor. According to a VPR-Vermont PBS poll released last month, 72 percent of respondents had never heard of Keith Stern. “I mean that's extraordinarily high and it's a high bar to overcome,” said Matthew Dickinson, a professor of political science at Middlebury College. Dickinson says Stern has an uphill climb, but he might be able to capture support from Republicans who feel Scott has drifted too far from the party’s base, specifically on issues like guns and immigration. Dickinson says Scott’s support of this year’s gun legislation might motivate some people to turn out. “If Scott's stance on guns is perceived by a significant number of gun owners as a betrayal and they're motivated enough they could turn out and in enough numbers that it in a low turnout primary, sure that could that could help Stern,” Dickinson said. One of those voters might be Terry Phillips. At the Addison County Fair and Field Days, Phillips recognized Stern and asked for a lawn sign, which Stern happily handed over. “Oh I stand with Trump,” Stern said. “I mean the law is the law." Stern said goodbye to Phillips — who said he’ll give his coworkers Stern’s lawn signs — and gets ready hand out more campaign pamphlets. After a day at the fair, Stern will drive back home and he says he’ll make plenty of stops along the way to introduce himself to more potential voters. Vermont’s 2018 primary election will take place on Tuesday, Aug. 14. The Vermont Secretary of State’s website has election-related information regarding voter registration, where your polling place is and more. Find VPR’s candidate interviews and profiles here.